An exciting thing is to create a MP3 composition by mixing them together in personal. If you are still curious about which free MP3 joiner is appropriate for you, you might as well see 6 widely-used MP3 joiners listed here. All of them are pretty easy-to-use with clean user interface. Don't waste time looking further; keep pace with us to see how big surprise you can get. As its name suggests, Free MP3 Joiner is an ideal tool to merge and join MP3 audio files with ease. By using it, you can feel free to combine different audio formats with different bitrates into a complete one. It will work fast without compromising quality. At the same time, you can stylize your own audio file by adding ReplayGain, adjusting quality, controlling speed, using normalization, etc. This tool also lets you handily convert audio files in batch, like MP3, WAV, AAC, M4A, OGG, FLAC, WAV, AIFF, VOC, etc. If you need, you can transfer them to portable devices for later playing, such as iPad, iPhone, iPad, Android, Windows, etc. 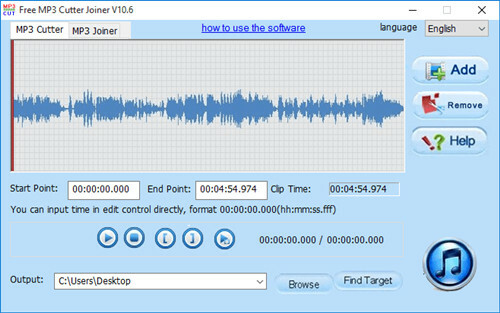 To create manageable audio file, this MP3 joiner freeware enables you to strip certain sections with pleasing parts left only. Alternatively, it's accessible to extract audio from video and rip audio CD, which makes it more comprehensive. You can get an incredibly wonderful user experience once you adopt Free Easy MP3 Joiner as your capable assistant. It is dedicated to audio joining, aiming at bringing best service to users. Under the help of it, you can merge numerous MP3 files into a new one without altering quality. Essentially, it delivers a superb platform to combine separate audiobook chapters into a large one. You can even join different music files together and make it an audio CD. This lightweight free MP3 merger as well has no problem in joining distinct types of audios and finish converting process flexibly. In addition to MP3, it can support more formats, including AAC, WMA, WAV, FLAC, APE, OGG, AIFF, M4A, VOX, RA, AC3 and CDA and so on. Amazingly, it is available for you to reset quality, bit rate, output mode, etc. at discretion. Basic and simple as Free MP3 Cutter Joiner is, it can be a fairly suitable tool for new starters. Without any complicated designs, you can simply set both start and end points, which is exact to millisecond. It permits you to mix multiple MP3 files with no cost. Working efficiently, you can make use of such a compact free audio joiner without damaging original quality. It also gives right to cut off needless portions in a precise manner. However, the biggest shortcoming is that it can only as an open source to deal with MP3 files, making more common and popular audio formats away. Free Merge MP3 is outstanding as what it does. It is able to not only merge MP3 readily, but also join diverse audio formats seamlessly, for instance, WAV, FLAC, OGG, WMA, etc. With the exception to merge feature, this free MP3 mixer is workable to act as a straightforward audio converter. Hence, it is feasible for you to carry out batch conversion. Additionally, there are preset quality and specify settings well organized for you to choose. If you are the one who wants to get both audio converter and audio joiner, you should grab this opportunity to try it. Here Weeny Free Audio Cutter comes to rescue. It is widely considered as one of the most forthright tools to manage audio files. 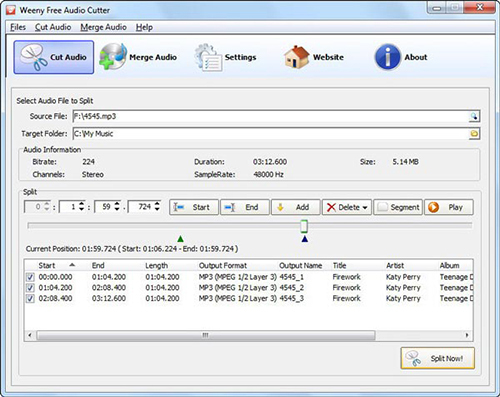 Taking the aid of this free MP3 cutter and joiner, you can firstly either cut your large MP3 files into small segments or join a vast MP3 tracks into single one. Thanks to its specially arrangement, you can apply it to make unique ringtone or create personalized CD without hassle. Apart from MP3, it also includes full support to WAV, OGG and WMA. As long as you use it, you will find it is convenient to see all parameters info of each imported audio track from the merging list. What's more, you are authorized to change sample rate, channel, bitrate, etc. in customized way. Simple MP3 Cutter Joiner Editor is absolutely a fantastically extraordinary program. Differing from other similar MP3 helper, it comes with a vast variety of functions to fit for possible requirements. Its built-in audio player allows you to preview the output audio file in advance so that you can check whether it matches your expectation. 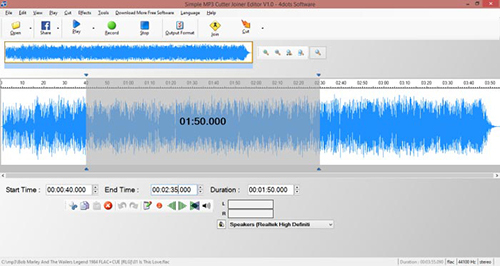 Full-functional as it is, you are entitled to cut, merge, split, mix and edit the designated audio files effortlessly. Remarkably, it has the option of saving edited audio file to MP3, AAC, OGG, RA, WMA, AC3, AMR, FLAC, WAV, AIFF, AU, MP2, OPUS, etc. 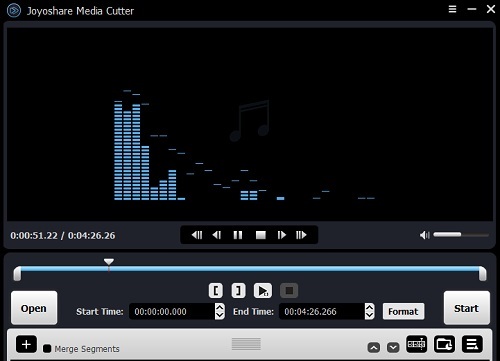 To delight you, Simple MP3 Cutter Joiner Editor offers unlimited undo/redo capability. Other than that, you can rework the resulted audio by changing related parameters, for example, bitrate, sample rate, quality, channel, bits per sample, etc. Importantly, you can utilize its charming effects at your own will, like fade-in, fade-out, echo, tempo, filter, equalizer, silence remover, normalize, reverse, noise reduction, etc. It's really eye-catching, so you can head to this free MP3 cutter download link instantly. Frankly speaking, free MP3 Joiner software can only satisfy your basic needs. To equip your own PC with an advanced and professional MP3 joiner, Joyoshare Media Cutter is a typical trustworthy choice for you to merge MP3 cuts from the same source. Its innovative acceleration processor can get cutting and merging tasks done at 60X faster speed in lossless quality. This optimal solution can even support nearly all existing audio and video formats. Most of all, it authorizes you to produce customized MP3 files by setting codec, resolution, channel, bit rate, sample rate, etc. Powerfully, it is uniquely developed with built-in editing tools, which helps you add sound effect, trim definite part, adjust volume, brightness, saturation, hue, aspect ratio, etc. Allow you to customize resolution, codec, channel, etc.